What a difference a couple of days can make. Having had a cold that left me lacking in energy, I didn't look after my 16 month old niece mid week as usual. That did give me a day where I was able to do some marking up of a quilt though. 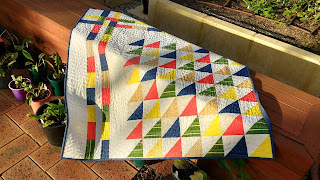 And then on the next day, I was able to quilt it! What fun. 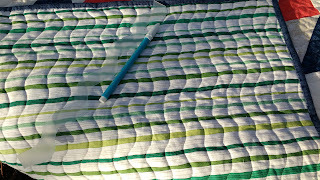 Waves everywhere, thanks to a small piece of templastic cut into a wave and my trusty wash out in water, marker. This is a view of the back, but you can see the template here and the pen - very useful tools! Then the front, which reminds me of sail boats. Its wall hanging size and I plan to put it up in our holiday place which is near the ocean - so that's quite appropriate. This is the front and I haven't quite finished the binding as you can see on the right hand side, but the shadows were coming in and so to get a daylight shot, I raced outside with it. 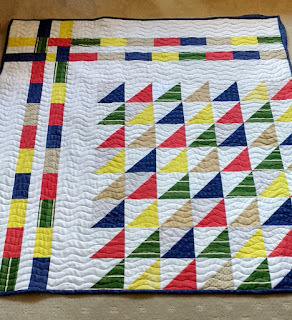 It was fun because I'd been quilting something else (hope to finish next week) that has more formal sections to it and this was just so free and easy. Its good to do something like that every now and again at least. Our small quilting group (about a dozen of us) had fun at our local (city) craft fair. After walking up the half dozen aisles full of displays of fabric, notions, machines, new techniques etc and then viewing the 100+ quilts from the quilting association, we were exhausted. Some of the women were both inspired and excited, though, to have a go on a long arm machine. 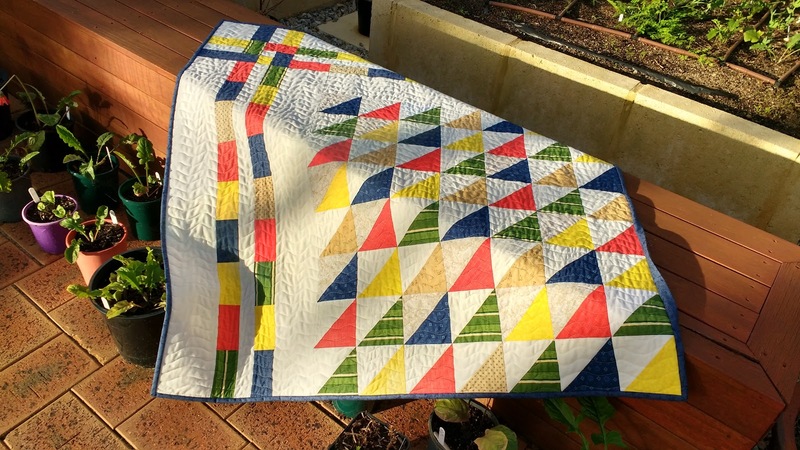 They cost about $10K (AUD) and so we will need to do some research to see whether, if we make community quilts, we can source a grant or fund-raise in some other way to purchase one in a year or so. It would certainly increase our quilt production to say nothing of the fun to be had along the way! Now onto the next of my waiting in line quilts, so that I get that list down from around 10! The quilt is very pretty. 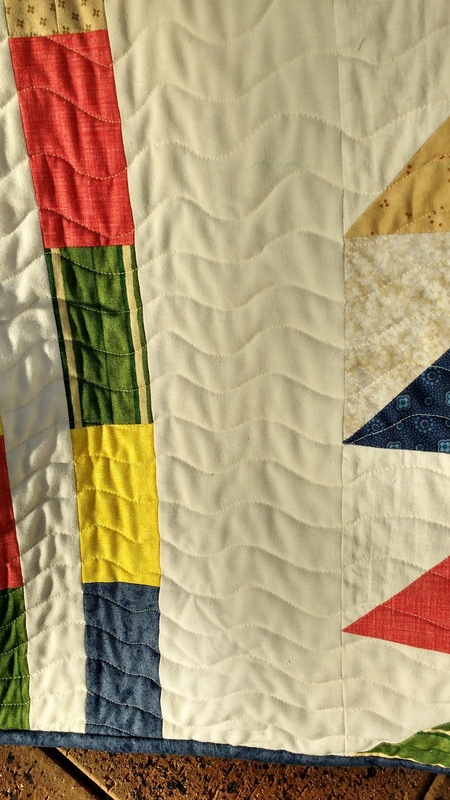 Curved lines was a good quilting design for her. What a beautiful quilt! 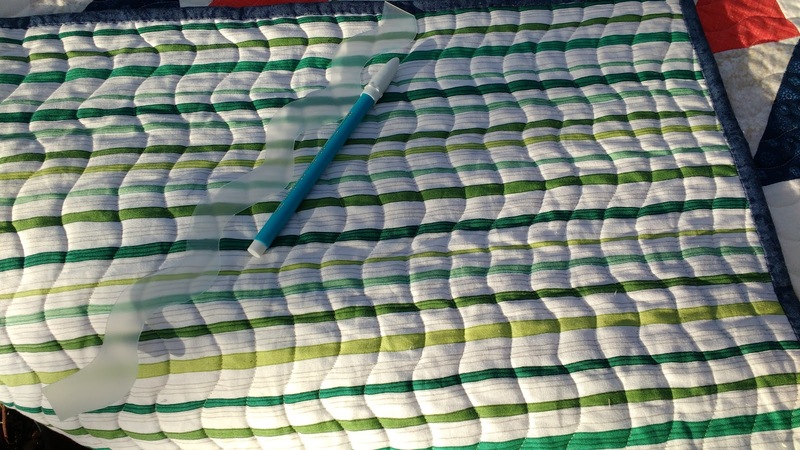 Love your quilting wavy lines, too! I am really loving your fun colorful quilt! I have seen one done similar but with sqs. instead of half sqs. I love yours more! Oh that is so cute! I love the setting!